The return of snowfall means the return of avalanches here in the mountains, evidenced by a documented avalanche on Loveland Pass last week. 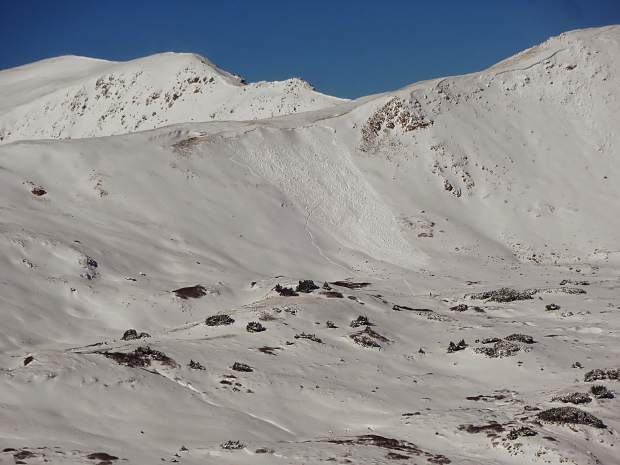 Robert Emmons submitted an avalanche report to the Colorado Avalanche Information Center last Friday, detailing a 200- to 300-foot wide avalanche he triggered that day while skiing across the ridgeline on the northside of Loveland Pass. Emmons described the area as east-northeast facing, with a roughly 35-40 degree slope and with 1-4 feet of windblown snow. The route was described as “Idiots Ridge,” above timberline and west of the top parking lot. Emmons described the conditions as having consistent wind-loading all morning, resulting in 1-4 feet of strictly windblown snow on top of an icy, rocky ground. He added that the heavy snowpack was not noticeably unstable. That said, Emmons triggered the avalanche he described as having a roughly 12- to 24-foot crown. Emmons also posted a video of the avalanche to his Instagram page, which shows him letting out a loud yell after he realized he had successfully skied horizontally out of the avalanche. Thus far this season, three avalanche observations have been reported to the Colorado Avalanche Information Center. The other two both had unknown triggers and occurred Saturday at Hoosier Pass and Sunday near Bobtail Peak, north of Jones Pass at the Continental Divide west of Berthoud Falls.